A few weeks ago, we hosted our first cookout in our new home. We served burgers and brats and a variety of sides, including this sweet, crunchy slaw. I never would have thought to pair carrots with pineapples and raisins, but the trio makes quite a tasty combination. What’s your favorite summer slaw recipe? Combine the first 3 ingredients in a large bowl. In a separate bowl, combine oil and the next 3 ingredients (through pineapple juice), and stir with a whisk. 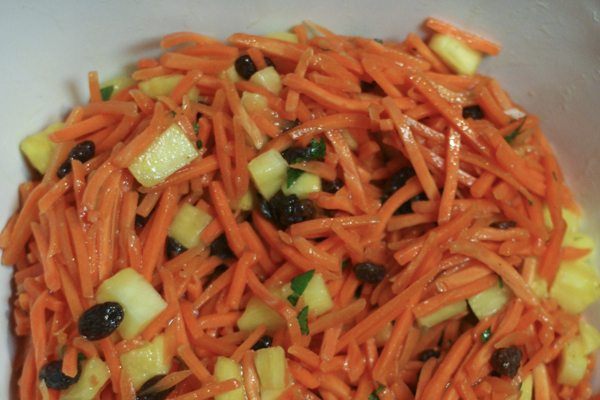 Add oil mixture to carrot mixture; toss well. Add parsley, salt, and pepper; toss well. Cover and chill. I love broccoli and carrot slaw. The dressing that I use was a bit of an ad-hoc creation – a couple dollops of of wasabi mayo & regular (reduced fat) mayo, apple cider vinegar, a generous squirt of honey, lemon juice, salt, pepper and sometimes a dash of hot sauce. Sounds yummy, Emily! Especially the wasabi mayo. I love dressing with a kick.